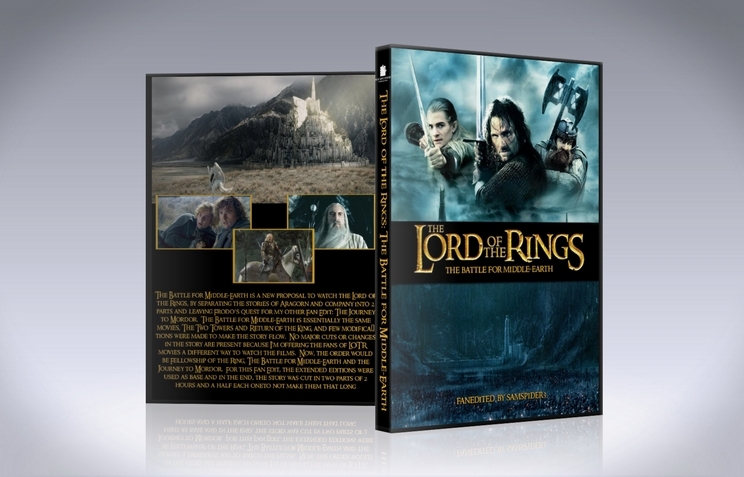 This project came out as a response of my Lord of the Rings fan edit, the Journey to Mordor, where we see the adventure told from the point of view of Frodo and Sam. By providing The Battle for Middle-Earth, I'm giving you an alternative way to watch The Lord of the Rings story, beginning with The Fellowship of the Ring, followed by The Battle for Middle-Earth Parts 1 and 2 and finally the Journey to Mordor. Esentially, these fan edits are THE SAME MOVIES and very few modifications or cuts were made to make the story flow. These fan edits were made by a fan of The Lord of the Rings movies, for fans of the Lord of the Rings movies, who appreciate every single momment of the films and do not believe anything should be cut. Do not expect cuts and differences to make the film as close as possible to the book as many have done here, because that is not my intention. As I said, It's an Alternative way to watch the Story, and even I still prefer the extended editions as they are, but I have hopes these fan edits will make your experience a little bit different. Part of the Soundtrack was used to fill some bits of music between transitions. Sony Vegas 11 was used for this Fan Edit. -Movie opens with Saruman narrating. We see how he builds his army. Title Card displays (The Battle for Middle Earth) Then we go to Eomer, Grima and Theoden scene. This segment was changed to the beginning of the movie because i felt it suited way more the Fan Edit. -After Eomer is expelled from Rohan, we go to Merry and Pippin being carried by the Uruk-hai and Aragorn and Company following the Uruk-Hai. -Rearranged scene: After Aragorn and company discover Gandalf is alive and he tells the story about how he survived, we see the scene where Gandalf, after falling in Fellowship of the Ring, fights the Balrog. Then we cut to the scene where Gandalf kills the Balrog and is resurrected. -Galadriel's Speech about the status of Middle Earth was cut because it was used in my Journey to Mordor Fan Edit. Instead, we just hear Galadriel telling Elrond encouraging him to fight for Middle Earth. -Rearranged scene: Merry and Pippin and scene where they decide to go the opposite direction of where Treebeard wanted to take them is shown after they are said to return to the Shire. The Scene where Treebeard discovers all the trees destroyed was placed where the other scene above was before. I had to do this because It felt kind of Awkward the transition of the scenes. Remember Frodo and Sam scenes were taken out so that is the reason why it looks like it lacks something. Rearranging the scenes like this, the problem was solved. -Rearranged scene: Merry and Pippin getting high was placed after Gandalf scene where he foreshadows the beginning of the Battle for Middle Earth. -Added scenes from Return of the King: Aragorn and Company arrive Isengard shortly after this, and they talk to Saruman, imprisoned in the Tower. -Battle for Middle Earth Part 1 closes with Aragorn asking Gandalf if he belives Frodo is alive, to what Gandalf answers yes. Total Length: 3 hours. 2 hours and 40 minutes without credits. -My name in the "Edited by" section of the Credits. -The film opens with the New Line Cinema Logo and usual presentation. Then fade to black. Snoring is heard (it's Gimli), then we see Aragorn getting up in the middle of the night. -Minas Morgul unleashed was edited differently because most of it was shown on Journey to Mordor. However, I decided to include one shot to stablish some continuity with Journey to Mordor, and then we know that at that point it is happening at the same time as Journey to Mordor. 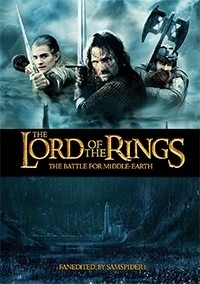 -Aragorn and Company going to the Black Gate was edited altogether. I used the shot of Sauron's eye from Journey to Mordor to stablish continuity. Same reason as above. -The film ends with an exciting cliffhanger. -A message is displayed at the end of the credits to tease Journey to Mordor Fan Edit. Total Length: 2 hours and 12 minutes without credits.